Promotional Causes | Promotional Incentives, Inc.
Third Annual Love That Dress! Over $100,000 Raised! 700 women. 3,000 dresses. Fifty pounds of chocolate, mango passion fruit martinis, rhinestones and bling, taffeta and satin, wedges to stilettos; haute couture fashion, frivolity, spirit-lifting dance music, and beaucoup girlfriend camaraderie, converged at the 4th Annual Love That Dress! The inordinate number of hours and impressive sponsorship dollars are indicative of the passion this community has for Believing in Girls, helping young women chart a new course in their lives through PACE Center for Girls. What started as a casual idea from two women discussing over cocktails what to wear to the next gala, has developed into a trademarked, signature event that raises thousands of dollars for PACE in several Florida communities. The out-of-the-ballpark VIP suites elevated the level of contributors to the third floor providing concierge service and a status that was the envy of all those who attended. These generous and influential supporters added significantly to the proceeds. Frequent and clever are the opportunities to contribute and take home some cool swag. The newly added ‘mall-type’ photo booth is a perfect example of adding to the fun and the total. The silent auction offered a bevy of female-desired products and services. The bidding was heated and down to the wire; always a good sign at a fundraiser. Photo courtesy of Sebrie Images Photography Copyright 2012 | Promotional Items supplied by Promotional Incentives, Inc. Accessories from White House Black Market and others sold out quickly with savvy shoppers who know the value of wardrobe accents. 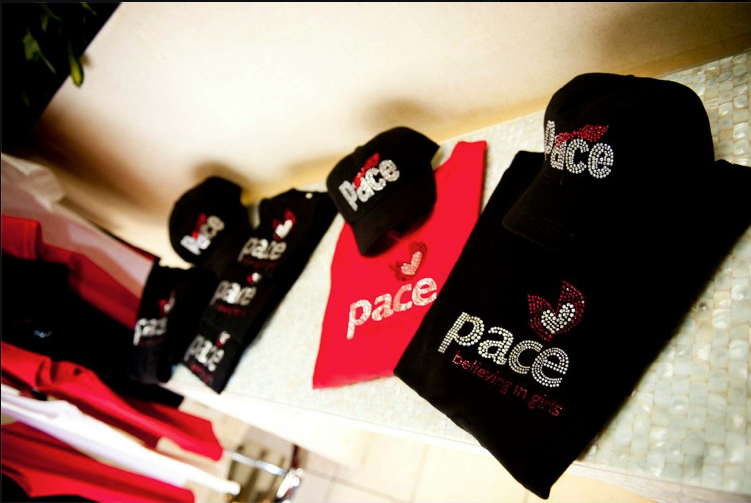 PACE bling shirts and hats were available at a reasonable price (courtesy of Promotional Incentives, Inc.), giving ladies the opportunity to promote Pace while looking great. Wearing one of these eye-catching garments is sure to solicit comments about the organization thereby enhancing community awareness. And if you get to the checkout kiosk, and still feel like you haven’t contributed enough, one can always round up their total and give a little extra to the Center. Although it may be unfair to single out individuals among the sea of volunteerettes, there are a few worthy of public recognition. The first “shout-out” goes to Christin Collins who birthed the idea four years ago. With her talent and immeasurable energy, Director of development Melissa Cofta gives her heart and soul to this event, and continues to astound. Co-chairs Amy Sanford and Kendra Sutton brought the event to new heights, in stature and grace under pressure. Cindy Lastovica and Barb Stevens, would have had the time clock spinning for all the hours they contributed by organizing dozens of volunteers, all with a perpetual smile on their faces. And of course the Embassy Suites’ staff continues to perform at a level worthy of a five star resort. The most elusive kudos of the night goes to the weather. For the first time in years, women dressed to the nines did not have to arrive in torrential rains. Brimming with fun, chic-iness and charitable hearts, Love That Dress! rocked the community once again. To volunteer, sponsor, find out more information about PACE, go to www.pacecenter.org/lee or call (239) 425-2366. The 2010 Class of the Chamber of Southwest Florida’s Leadership Lee County program led the way to kick off the final phase of fundraising for The Heights Foundation in its mission to restart construction on the Harlem Heights Cultural Arts & Community Center. 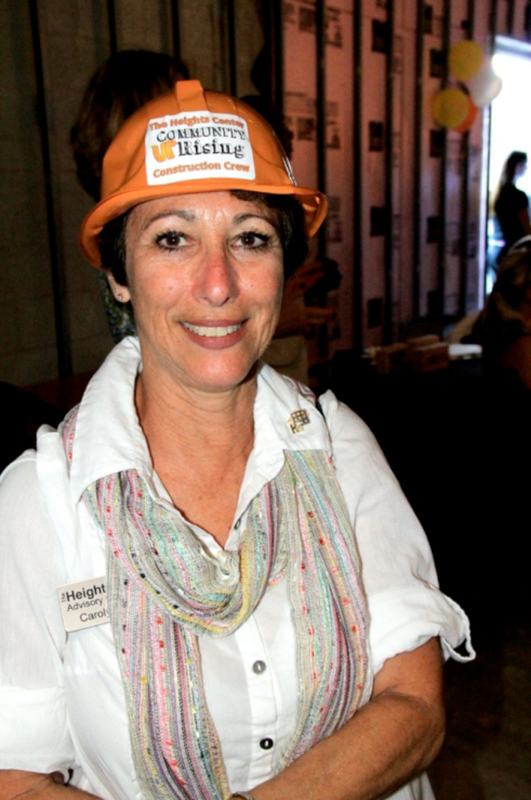 The group raised $37,000 in donations from the Community UP Rising event held on June 1 at the Heights Center. 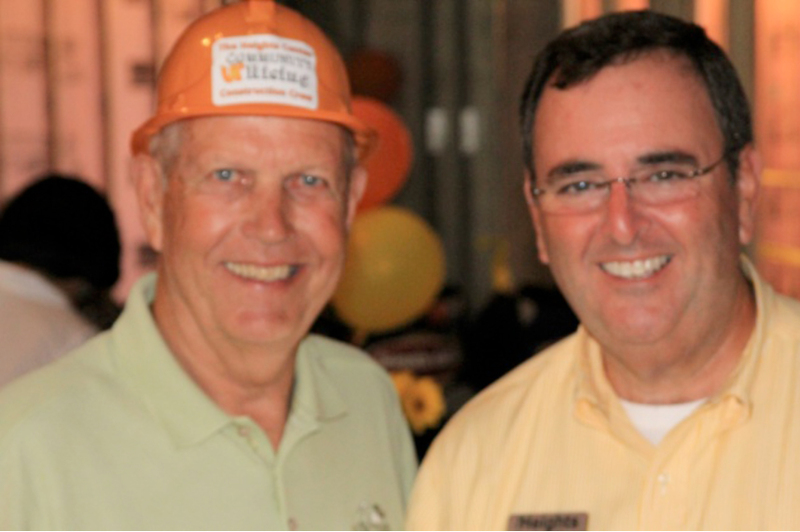 To add a little fun and color to the ground breaking, Promotional Incentives provided Heights Foundation with bright orange construction hats (orange is one of the predominant colors in the Heights Foundation logo); a low cost, highly visible promotional item worn by dignitaries, board members, sponsors and the general public to share the excitement of this incredible endeavor for the southwest Florida community. The Center will provide with enhanced access to the arts and improved education, training and enrichment programs for the residents of Harlem Heights and surrounding neighborhoods of Harlem Heights. With nearly $450,000 of the $6.5 million capital campaign goal remaining to be raised, members of Leadership Lee County are still asking the community to support the building the project.